Barbecue Cocktail Weenies. What party doesn’t have a version of this classic? With Jumbo’s Everything Sauce, it’s as easy as can be to have a delicious crockpot full of these delectable little goodies. Put it out for guests, family, or heck, just treat yourself to a crock full of this sweet and tangy, meaty goodness. You will only need three ingredients, a good crock pot, and some electricity to make this dish work. 2 Jars of Jumbo’s Original or Jalapeno Sloppy Joe Sauce. Make it two jalapeno, two original, or one of each, the choice is yours! Follow these instructions closely! 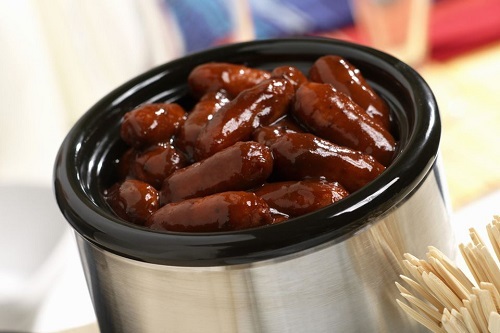 Empty the entire contents of the Hillshire Farms Li’l Smokies into your crock pot. Pour in the two jars of Jumbo’s Original or Jalapeno Sloppy Joe Sauce. Add the 1 1/2 Cup Welch’s Grape Jelly. Cover the crock pot. Turn on the crock pot to the Low setting. Stir the contents of the crock pot occasionally until heated completely through. Enjoy.